The Owl Creek Veterinary Hospital team of skilled veterinarians welcomes you to our practice. Proudly serving the Virginia Beach area. At Owl Creek Veterinary Hospital, it is our daily privilege to provide quality vet care to your cherished pet, with compassion and competence. We hope to ensure a positive impact on our patients, pet owners and the local community. 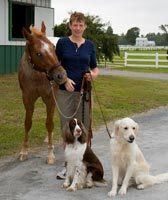 Dr. Ayre has been with Owl Creek Veterinary Hospital since November 2000. She has been the hospitals Managing Veterinarian since June 2001. Dr. Ayre is originally from Toronto, Ontario and graduated with honors from the University of Guelph, Ontario Veterinary College in 1993. Dr. Ayre worked in Cape Breton Island, Nova Scotia from 1993 until 1999. Dr. Ayre has a special interest in animal dentistry, and has taken courses in advanced dental care and surgery. She has an English springer spaniel, Maggie; a golden retriever, Jake; two English cocker spaniels, Ollie and Lilly; and 3 horses; Johnny Appleseed, Ace, and Grace. Away from the clinic Dr. Ayre enjoys spending time with her husband Todd and their four girls; Sarah, Emma, Madelyn, and Kate.